A new copulin analog derived from a natural plant hormone which, when concentrated, gives off a honey-like scent which is incredibly evocative of sexual arousal; the smell attracts bees, insects, birds and animals to the plants, aiding in pollination. In tribute to its methodology we have named it after the Yoruba goddess Aja, the Orisha of the forest and all who dwell within. She is the patron of those healers who practice the herbal lore she created. Desire is the universal principle she fosters, driving the natural world towards fertility, fecundity and diversity. Glass bottle with glass dipper, 1/4 fl.oz. 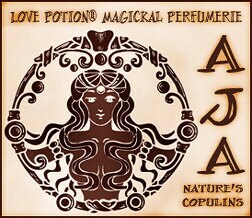 Instructions: Aja has a generally pleasant honey-like scent and may be worn with or without perfume, applied directly on skin or added to your favorite scent.